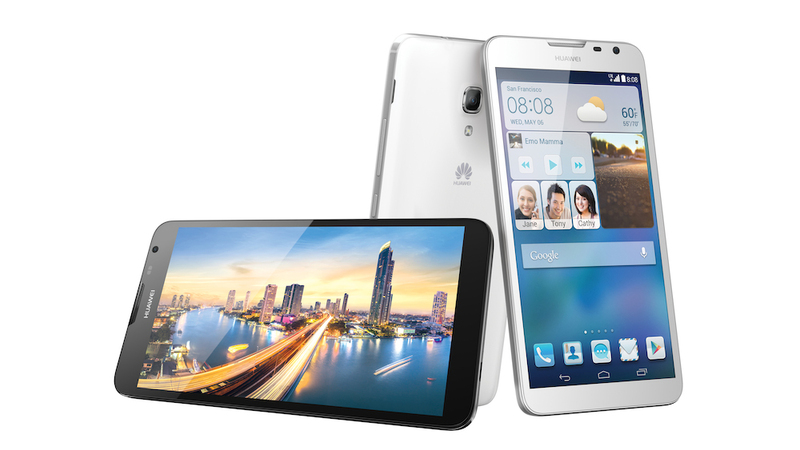 Huawei is going in hard to the American smartphone market. Today, the company announced availability of the Ascend Mate2, a device for the phablet-loving, budget-minded folks among us. The device will be directly available to anyone who would like to purchase a unit, unlocked with access to 4G LTE connectivity, for the price of $299. For specs, the Ascend Mate2 features a 6.1″ 720p display, Qualcomm-made quad-core processor clocked at 1.6GHz, 2GB of RAM, 16GB of on-board storage, Bluetooth 4.0, 13MP rear-facing shooter, 5MP front-facing camera with “Groufie” feature, 4,050mAh battery, and comes out of the box running Android 4.3 (upgradable down the road to Android 4.4+). Huawei was kind enough to give us a unit to play with, and the first thing you will notice is the overall size. It feels very large, even making the Galaxy Note 3 and Sony Xperia Z2 feel somewhat manageable with one hand. Unless you are Shaq, this will be a two-hand device for most humans. For $299, with the access to 4G LTE on T-Mobile or AT&T, the Ascend Mate2 is quite an unlocked deal for American smartphone buyers. If you ask us, there are not enough unlocked, cheaper options for US buyers to choose from. Whenever you get down into the $300 range, OEMs drastically cut specs in order to make some type of return, but Huawei looks to have found a comfortable middle ground. While the display is only 720p, it does feature fine-enough detail, plus you can expect your massive battery to last you two days easy with nothing crazy for it to power. The camera is decent enough for being 13MP. Huawei’s skin still needs a bit of serious work, and with the device launching with only Android 4.3, we find ourselves frustrated. The company states an update will be announced sometime in the future. Have questions about the Mate2? Ask them in the comments section and I will answer them promptly.